Lavender (Lavandula angustifolia) is a perennial-growing herb native to regions in the Mediterranean. Although slow-growing, lavender makes for a tidy, low-maintenance fragrant ornamental addition to any flower or herb garden. Plant lavender in rich, fertile soil that provides good drainage. Plant the lavender in a sun-filled location. 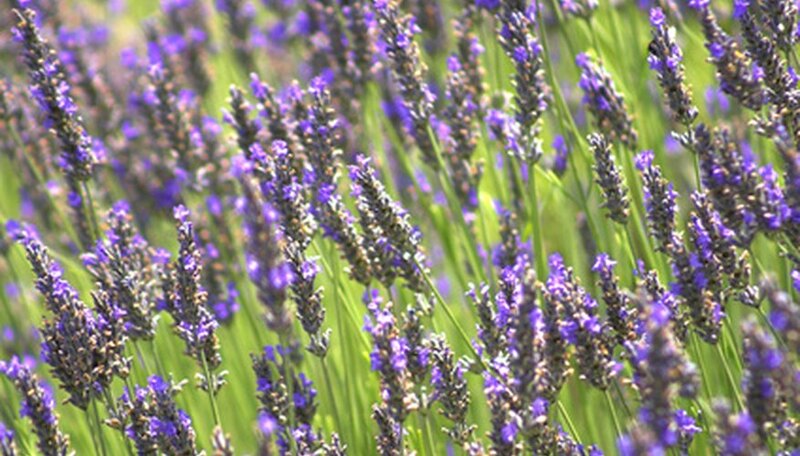 Lavender does best in full sun, according to the University of Florida. Turn over the soil in the planting site down to a depth of between 12 and 18 inches, using a spade. Lay out a 2- to 3-inch layer of sphagnum peat moss over the planting locaton to improve drainage and make the soil slightly more acidic. Spread out a 2- to 3-inch layer of dehydrated plant-based compost or aged manure over the planting site to improve the fertility of the soil. Mix the moss and compost or manure into the soil, using a garden fork. Dig planting holes of 12 inches wide and 8 inches deep if planting lavender from a 3- or 4-inch pot. Dig holes 18 inches wide and 10 inches deep if planting from a 6-inch or 1-gallon planting pot. For planting lavender growing in a 5-gallon pot, dig planting holes 20 inches wide and 14 inches deep. Each of the planting holes should be between 2 and 3 feet apart. Use a spade to dig them. Lay the growing container on its side, if planting lavender from a 3 or 4-inch pot. Use a hammer or a small block of wood and tap down along the rim of the pot to slide the pot from the root system. Starting at a drain hole, cut along the side of the planting pot with a pair of all-purpose snips, if planting lavender from a 1 or 5-gallon pot. Plant lavender into a previously created planting hole. Check to ensure the lavender is sitting with the top of its root system is at the same height to the surrounding topsoil. If necessary, remove the lavender from the planting hole and scoop in shovelfuls of dirt until you are certain the lavender will be planted at the correct height. Scoop in a few shovelfuls of soil in and around the root system of the lavender to secure it in place. Hold the lavender vertical in the planting hole while you fill the hole 2/3 with of soil. Tamp the soil down in the hole with your foot. Fill the remainder of the planting hole with soil. Water each of the lavender plants thoroughly. Provide 1 to 2 gallons of water per plant, if you planted lavender from 3- or 4-inch pots. If you planted lavender from 1-gallon pots, provide each plant with 2 to 3 gallons of water. Provide 5 to 6 gallons of water per plant if you planted from 5-gallon planting pots. To keep moisture in and help protect lavender plants over winter, spread a 3- to 4-inch layer of bark, grass clippings, pine needles or other similar material for mulch around each lavender plant.